The knit graffiti looks really cool. Creators of the fiber squares and visitors at the Faire are being asked to write messages to the universe and attach them to the squares. I already had 2 messages on my squares and got The Hub to write one while we were there. I think it's safe to say there is an abundance of yarn on the boosters of this rocket. There was also an abundance of other cool stuff at the Maker Faire that I will post about sometime soon. What a cool project to be a part of! That is so cool!!! That's awesome that you found your own squares. What a neat project! That turned out so awesome! And I really like the idea of adding a note to the universe. So cool! How great it must feel to be part of such a great project. That looks so great. I can see why you are proud to be part of it. Yay! The squares are great and your pictures are awesome! I can't believe there are so many squares. Thanks again for letting me mail you my square and thanks for the great blog post. What a neat thing to be part of. Congrats. Yup, you can't beat yarn for connecting with others! This is such a neat project and how great that you were a part of it! I love, love, love this project!!!!! It's gorgeous. Congrats to you for participating! Wow! That is really amazing. I love the effect of all the colors together! What a terrific project. 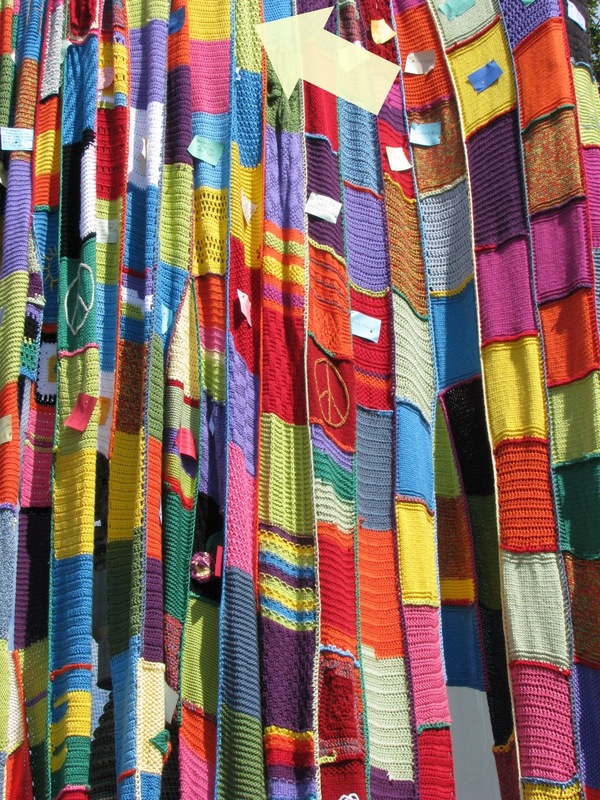 I love that these will become charity blankets, and hope that the recipient gets something to tie the blanket to it's previous life as rocket graffiti. i love all the bright colors!!! so awesome! Yay you! This is a fantastic project. did you read Robyn's post today.. it so wonderful! I took a ton of photos--but i have blog fodder overload--and i think i am just going to link to Robyn blog for the story about the Yarn Bombing. Oh! This is so cool. I LOVE it! Really, really love. You have the best ideas : ) and I always smile when I come to visit you! What a fabulous idea. I love this!